The Sixth Doctor, Henry Gordon Jago and Professor George Litefoot land on a beach in 1590 Roanoake Virgina. They are instantly set upon by native Americans and Jago flees into the woods. The Doctor and Professor Litefoot are captured by the native chief, Wanchese, who decides to execute them for the disappearance of his daughter. Jago finds himself in the lost Roanoke colony and runs into the rescue party lead by John White. They soon learn that a plague brought by ghostly children is to blame for the disappearances. Our heroes must save themselves before they become like the lost colonists. This story is much darker than Voyage to Venus. It has its share of humor that is rather nicely integrated. However, this is an incredibly chilling story that really had me wonder what was happening. The tone is a little strange for how humorous Jago and Litefoot tend to be, but allowing them some dramatic leeway is richly rewarded. The Sixth Doctor spends most of this episode trying to figure out what's happening. Aside from some strange semi-racist remarks (that may not be understood by the British writers) the Doctor is his usual self. He is willing to lead men into the jaws of death itself to do what he thinks is right. Henry Gordon Jago melds the hilarious and somber. He is the first of our cast to fall victim to the mysterious plague, so it becomes a race to save him. He has an interesting exchange with the mysterious Governor of Roanoke. Also, bonus points for squeezing a Christmas Carol reference to try and make this ghost story a bit more Christmasy. Professor George Litefoot teams up with the Sixth Doctor and gets to stretch his usual straight man role. He gets some of the funniest lines. His friendship with Jago is tried as they face the horror of the plague. Wanchese is the leader of the Algonquian tribe. I was concerned that he might be a Native American stereotype, but he turned out to be far more interesting. His character blends into the background for much of chapters 2 and 3, but he surprised me by the end. His subtle use pays off well. The children are as creepy as they seem. The explanation behind them had the potential to be stupid, but it has an interesting angle that I wish they'd explored more. The Governor is an old man who seems both enslaved by and in charge of the children. They have a somewhat annoying tease about his possible identity, but the truth is far better. His conclusion puts a haunting cap to the tale. This piece is greatly helped by its atmosphere on the swampy beaches of Roanoke, Virginia. It almost conjures up a Lovecraftian vision of ancient and savage New England ruled over by powerful spirits. This ending of this story is somber and fits the tone of the piece. Then of course, it slips in the hook for Jago and Litefoot series five... and it is fantastic. I cannot wait for the release of that series and I still need to catch up on the rest of the show. This twisting ghost tale may not be quite as enjoyable as its steampunk romp predecessor, however its still a great listen. I think its biggest flaw lies in the lower use of the characters' strengths. However, it is a nice change once you get used to it. We have another fantastic hour's worth of entertainment for five dollars! 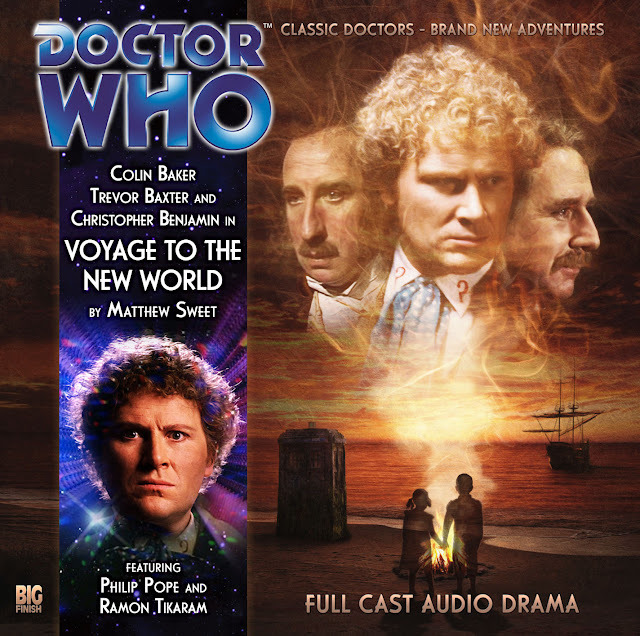 Also, see my review of Jago and Litefoot's series pilot: The Mahogany Murders, as well as the first Voyage audio: Voyage to Venus.